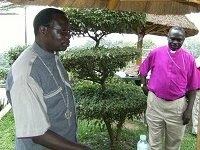 Christianity in Africa is under attack by Gays and Christians in Europe and the Americas, claims Bishop Joseph Abura of Karamoja Diocese (on the right in the photograph) in an article on Spero News: http://www.speroforum.com/a/23193/For-some-Anglicans-Vices-are-now-Virtues. I’m going to post most of his article below, so this will be a long blog, but the Bishop’s views deserve to be read in full. The diocese of Karamoja in North-Eastern Uganda is linked with Alton Deanery in the Diocese of Winchester. A report on the web site of St Andrew’s Medstead says the church in Karamoja plays an important part in unifying and reconciling communities and it is growing. The church is both a tool for development and encourages faith. The Karamojan church is marginalized geographically and socially so the link is tremendously important to them. The Deanery welcomed the Rev. Joseph Abura in 1999 before the diocese was divided into two in June 2006 when he became the bishop of South Karamoja. Two Deanery clergy attended the inauguration ceremonies. The bishop says it is appalling to read of global opposition to the Anti-homosexuality Bill and the agitation being stirred against legislation that would allow Priests and Ministers to be imprisoned for up to three years if they failed to report any homosexual activity of which they become aware. It is indeed deplorable, writes the bishop, that humanity has or is nearing extinction just like the time of Noah and the flood in the Book of Genesis chapters 6 and 7. Yes the Lord Jesus prophesied of the last days that people will be lovers of self. Truly, humans have natural evil bent. They are bent to evil by nature. Laws, rules, commandments are in place geared towards saving man from own direction and destruction. After the honor was bestowed upon them, the West and the North degenerated into individualism, began to walk alone and shut their doors to all except himself even on to Churches on Christian days like Sunday, they declined to set foot in. This way they became spiritual idlers, they fell prey of the devil who found access into their solitary lives. Also they espoused the benefits of knowledge and wealth and applied it to or against anything including God and His Word. Mammon became the new god. Due to the discovery of iron, gold, and knowledge in the 13th through to 18th centuries, man took center stage and sat on the throne of his own life. He became self-centered and not God-centered. He looked to self and conceived of personal traits which now have misled him, have put him to the situation of being inhumane, looking at own self, own feelings, and not the feelings of others. They devised own and individualistic rules now called “rights”; they did exploits on rights accepted globally and now misused or even misinterpreted or misappropriated them. These are rights called so by the disoriented and their sympathizers as they were/are developed from defiant and deviant spirit. As a result of sin the vice of homosexuality and lesbianism caught up with them and they practiced and popularized it in the name of own rights. They became animated and contracted it from the sower of evil. "You are of your father the devil, and you want to do the desires of your father, he was a murderer from the beginning, and does not stand in the truth, because there is no truth in him, whenever he speaks a lie he speaks from his nature for he is a liar and father of lies" (John 8 : 44). Today, it is about blood and flesh, not the Word of God; gays tend to make a big deal on own feelings, own fulfillments, their sympathizers too tend to do the same. They are now swimming in their own ways and gone back to the situation Apostle Paul is describing in his Epistle to Ephesians Chapter 2 vs 1 – 2, ”And you were dead in your trespasses and sins, in which you formally walked according to the course of this world, according to the prince of the power of the air, of the spirit that is now working in the sons of Disobedience.” Indeed they have become dead in their transgressions and sins being led by the prince of air and have become sons and daughters of disobedience. They no longer believe in the Word of God, they believe what they think, feel, and do what they say is their right, not what God or society want; they have nothing to do with good and accepted norms. They now want to legitimize lesbianism and homosexuality even when they know it is wrong and is against the Word of the Lord. Yes, there are those who are sick from it, that they have been overwhelmed by it. Yes, if and since it is sickness, it should have antidotes to correct it. Indeed, we understand them and pray for healing upon them. The world over should be on the search for drags or vaccines to treat and prevent it but not to make it acceptable. The Episcopal Church in Canada has already departed from the truth. The Anglican Province of the Church of Uganda and some other African Churches including some from the very northern America, Europe, have already cut relations with Episcopal Church of Canada and any who have resolved to pursue the gay agenda. The Ugandan government and parliament should not listen to such which want to uproot or bend our cherished traditions and values. In Africa and the world over, there were many wizards, every village had at least one. Being a wizard was as much a vice as homosexuality and lesbianism. It would overwhelmingly possesses the victims and enslaves them just as homosexuality does to its victims since it is a spiritual and moral matter. It was the case of being disoriented. Wizards would kill people, play with dead bodies, molest animals sexually, did many dirty things. They possessed unexplained drive, they were disorientated. But with the coming of the light of the Gospel of Christ. such tendencies have been wiped out or tremendously reduced much as communities and societies fought to eliminate such anti-human behavior. Today's "Rights" activists would love us respect them and legitimize such vices: what blindness! What a fallen race! If rights groups are looking at man - the fallen man who has natural evil bent - and are protective of every sin, every evil man does, every abnormal tendency, for the sake of human rights, then they are leading this world into limbo. Behold, every single nation be they acts or actors, are going to be judged by God: they will all appear before the judgment seat of Christ to answer for their deeds, deeds to the flesh "the temple of the Holy Spirit." Homosexuals and worshippers of the vice are all going to face their creator; let the world not be deceived, judgment is coming upon the world. Homosexuality and lesbianism is now being exported to the rest of the world, to Africa and Latin America, and elsewhere. They want to coerce African parliaments like the Ugandan one to condone and legitimize the vice. They want it to become a virtue. God forbid. But, should lesbianism and homosexuality be left to thrive and invite God’s judgment upon the world? Can’t this illness like HIV/AIDS be fought? AIDS/HIV is not against the Bible and the Word of God, but homosexuality does because it is spiritual. Why accept to compromise and destroy self and entire human race? Yes, God punishes sin, He punishes all sin. “The wages of sin is death”” (Romans 6:23), eternal death. The world then has to be punished. Gays tend to understand God and His Word differently. They think Africa misinterprets the Bible, “that Africa reads the Bible the wrong way”. Such of course are perverted mind as St. Paul writes, “I know that after my departure savage wolves will come in among you, not sparing the flock: and from among your own selves, men will rise speaking perverse things to draw away disciples after them (”Acts 20: 29, 30). Gays or their sympathizers who many of them are Christians no longer see God as the answer, or they don’t understand homosexuality and lesbianism as disease. That is why they can dedicate a day as an international day of prayer, more over to God, with a hope to perpetuate it, against the Ugandan parliament who soon may pass a motion to check its growth. This means the gay love their thing, they like it, and they want it to grow. It is no longer an abnormality or vice, it is now a virtue and they want it so. Christianity indeed is under attack; attack from within herself and by her very own. Persecution of the church is on the loose. The powers and world forces of wickedness (Ephesians 6. 12) are now in real play. Yes, laws if in place can help put on check any vice including this one. Like HIV which breads among others, in disco halls and night drinking sprees, which can be stopped or reduced by laws if put in place, like the wizard spirit which society and the Gospel of Christ shunned, the vice of homosexuality through the necessary laws in place can be checked. We must keep it away from our children. Our ancestors didn’t know it, we do not know it, our children must not know it. Our children are ignorant of the vice; but gays and their sympathizers want to appeal to their psyche, to their consciousness that they be infected too. They are spreading it in our institutions of learning. They want to condition every penny that comes to our government or churches or Non-Government Organizations. If you are dinning with such evil plan, come out of it; the Province of the Church of Uganda, as you know, is leading the way, let’s join the way. Homosexuality is infectious, it is a disease in the West and not so much in Africa and that is why they want to influence any agenda in order to entrench it. If it is inborn as they say, then it is transmitted and conceived in the mind, that it actualizes itself in one. Africans who have it have contracted it from the West or from acquainting with people who have it. Yes, it is infectious and it can be fought and defeated. It is a vice which has multiplied in the recent decades in the West; it can be fought and stopped. Africa, run away from gays, let us save our continent by refuting the vice; practice, and preserve our heritage, that is our traditions and culture believing and trusting in the Almighty God. “”Rise and shine for your light has come, and the glory of the Lord is risen upon you”” (Isaiah 60 : 1). Gayism can be fought like any other disease against the people and the Word of God. It is a sickness so we can fight and defeat it. One of the ways to fight it should be by prevention of its spread, by putting laws in place, preach the Word and pray to God to heal and orient those disoriented; there is need for a commandment(s) to enforce. Christ is the answer, feelings or sympathies, especially on evil, are not! Ugandan Parliament, the watch dog of our laws, please go ahead and put the anti- Gay laws in place. It is then that we become truly accountable to our young and to this country, not to Canada or England. We are in charge! We have our entrenched birthrights, Ugandans should not accept to sell or mortgage these God given birthrights. “”Rise and shine for your light has come, and the glory of the Lord is risen upon you”” No display of FEELINGS here...the good Bishop is blinded by his own overpuffed zealotry...I ¨feel¨ sorry for the desperate state of his ability to cope with reality, it´s almost non-existant...afterall, leading the charge to put Anglicans and others to DEATH is hardly the work of a loving God or a servant of a Christ who embraces the marginalized, the victimized the suffering...The Anglican Bishop Joseph Abura of Karamoja Diocese fashions himself as the ¨suffering¨ victim and sends out a ALARM regarding the ¨contagious LGBT¨ disease (just what he needs, a fake disease). The ¨bishop¨ is a victim of his own obessive fear and hate, most probably trying to make a grand impression on Orombi too and wants into the ¨family¨. P.S. +Joseph, don´t call me a instrument of the devil you grandstanding, self promoting, arrogant and DANGEROUS puffed-up old fool. I don´t like being LABELED by MORE of your ugly name calling and ignorant judgements...murder-mongering is not a VIRTUE..no, not even at The Anglican Church Uganda! What an appalling document. THank you for giving it the exposure it deserves, as it deserves little else. Truly stunning in his ignorance! Homosexuality as a communicable disease. I'd be ROTFLMAO if this weren't so pathetic. I think they should join the Catholics. Astonished at the low quality of African Anglican bishops -- and these are being given First Tier status in the new Covenant proposal? We would no more give space and honor to an American clergy person who spouts this nonsense than to one who spouts infant sacrifice. Why, then, is a bishop of Uganda to be treated any differently? Respect for religious views and hierarchy must end where evil begins. Thank you for posting the bishop's statement in its entirety so that all can read it. It is very difficult to comprehend the kind of mind - the kind of Christian mind - that leads to these thoughts and conclusions. This is such sick theology one doesn't know where to begin.... I cannot understand how the rest of the Anglican Communion can say this thinking is part of our tradition. It isn't. Never was. Uh, it seems to me like you might WANT to be out of communion with this sort of thing. Failure of catechesis, I'd say. I belive we should be concentrating on saving these babies who are being "abused". I will be travelling back to Uganda on the 17th December and hosting a christmas party for the Karamojong street children on the 25th December. I have also set up a charity and its main objective is to eliminate Karamojong babies begging on the streets of Kampala. Ladies and gentlemen, I need your support. My website is www.kaana.org and telephone no is 00447778532675. I thought I would use this platform to highlight the plight of the Karamojong street babies and not the homosexuals. I am a priest in the Anglican Church. I dont want to be seen to be supporting either side. But questions abound which we must answer. Why do we have dwindling congregations in Europe? And in Africa - why do we continue to wallow in poverty and civil wars? What does the Bible say about worshipping material things? What does the Bible say about leadership? At times I see as both sides of the divide are pointing fingures at each other and forgetting that if one fingure is pointed at your neighbor - three are pointing you. Let us respect each others stand. Let us wait for the judgement day and ask God who was right and who was wrong. We have no right passing judgement now.